The Southeastern Pennsylvania Transportation Authority (SEPTA) is one of the nation’s largest public transportation agencies, with an average weekday ridership across the system of approximately one million passengers. SEPTA service extends throughout the five counties in and around the City of Philadelphia, including one rail line that serves Trenton, NJ. Modes of transportation include buses, trolleys, trackless trolleys, subway trains, regional heavy rail trains and special purpose vans. Generate a specification list for a key control system, based on SEPTA’s salient needs and encompassing the widest number of manufacturers’ features. The specification is then put out to a competitive bidding process. In addition to the specification list, the product should be easy to use, reliable and durable and require minimal maintenance. The system is to be used 24/7 and 365 days a year, in a primarily industrial environment, for the issuance, tracking and reporting of key activity. SEPTA maintenance and money – collecting employees use keys to access money systems in the performance of their duties. The loss or theft of these keys increases the potential for theft of cash derived from passenger receipts. Previously, the keys were kept loose in a desk drawer and issued by management with only multiple copy paper forms as an audit trail. On one occasion, a maintenance employee lost a set of keys and didn’t report it for several days. Because the key ring was never found and because this left the operation more vulnerable to theft, all of the locks and keys had to be changed, incurring considerable time and expense. Following this incident, it was determined that a more thorough and reliable key control system was needed. 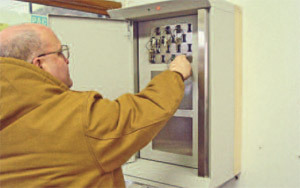 SEPTA also required a locking and tracking cabinet that could accommodate their over-sized bullet keys, used for opening the fare box cash vaults. The bullet-shaped steel enclosure and key weighs approximately one pound and cannot easily fit into a traditional tracking cabinet. KeyWatcher® Key Control System – The KeyWatcher is a custom designed solution that automatically records the access history of each key, including user, date and time of checkout/return, enabling SEPTA to keep control of regular keys and the bullet keys. The system releases assigned keys only to users with the proper authorization code, and cannot be manipulated or easily tampered with. The unit’s rugged stainless steel construction and near indestructible key fobs are designed for the 24/7 heavy use that the SEPTA will demand and the illuminated key slots make accessing and returning keys easier. KeyPro® Performance Software – The userfriendly PC application software delivers real-time polling transactions, status, alarm and reporting capabilities for the KeyWatcher system. Activity reports can be customized to trace key movements by time, date and user code or biometric access data. Because the software allows the KeyWatcher Key Control System to be conveniently accessed and programmed remotely via an IP connection, control of the keys can be more efficiently and safely managed. Additionally, priority email alerts can be sent to management to keep them informed of the whereabouts of high security keys or if they have been accessed at odd hours. SEPTA has 15 KeyWatcher cabinets installed, including ten in bus garages throughout the region, two in maintenance shops, one in the operations control center, and two in the money counting facility. Most of these locations are used around the clock, every day of the year, with approximately 480 access/return transactions completed on an average weekday and about 100 over a weekend. Approximately 100 users have access to the keys. The key cabinets range in size from 16 key capacities to 48 key capacities and two of them include the custom designed locker for securing the bullet keys. The KeyPro Performance Software generates reports which provide accurate and detailed information, such as which employees accessed the keys, when they accessed them and when they were returned. Management also performs administrative functions such as accessing and programming the KeyWatcher system using this software. The SEPTA is a quasigovernmental agency and cannot select a particular model or manufacturer, as large procurements are subject to a competitive bidding process. Morse Watchmans provided the winning bid, both in 1997 and in 2008, and their products are durable and user friendly. SEPTA receives excellent value for the price. The KeyWatcher performs the activity tracking as required and the KeyPro Performance Software provides the managed activity reports. Upgrades are provided in response to requests for improvement and Morse Watchmans is quick to respond to special needs such as the custom modified locker for securing the bullet keys. Since the installation of the KeyWatcher system, SEPTA has been better able to manage the keys and in so doing, address their vulnerability and exposure to theft. In addition, because of the success of the system, all SEPTA keys are now secured in KeyWatcher cabinets.